Want 4K goodness without breaking the bank? Here's some awesome cheap 4K monitor deals for designers and artists. Welcome to our list of the best cheap 4K monitor deals in 2019. Happily, these days upgrading to a 4K monitor doesn't have to mean spending obscene amounts of money. Here you'll find a carefully curated selection of brilliant ultra HD monitors that won't break the bank. Many of the screens below are aimed at gamers, which means they're also perfect for video editors, photo editors, designers and digital artists – in fact, anyone who wants to see accurate colours on their screens. That's because using a monitor with 4K resolution (also known as UHD, as it's a bit less than 4K, with a resolution of 3,840 x 2,160) enables you to view your work in all its glory. If you choose a 4K monitor with HDR (High Dynamic Range), your colours will look even more vibrant and realistic. However, bear in mind that 4K screens with HDR support can be more expensive. Before investing in a cheap 4K monitor deal, there are a few things you should keep in mind. You'll need decent hardware to power the monitor, so you'll need a relatively recent discrete graphics card. Try the Nvidia GeForce GTX 1080 Ti or 1070 Ti, the AMD Radeon RX Vega 64 or AMD’s Radeon Pro SSG Graphics card. Also, watch out for refresh rates. Some budget 4K monitors cut corners and may only offer 30Hz refresh rates. While that's OK for working, it might cause your monitor to feel a little sluggish when displaying animations. You'll want a 60Hz panel if possible. Some budget 4K monitors also have narrower colour gamuts, which will lead to colours not looking their best. You won't find these issues in the brilliant budget 4K monitors we've got here, though. Read on for our pick of the best cheap 4K monitors – and 4K monitor deals – and find the perfect UHD screen for your needs and budget. And if you're in the market for some new creative kit, keep an eye on our roundup on the best Black Friday and Cyber Monday deals. The best cheap 4K monitor you can get. Balancing budget and performance, the Iiyama ProLite B2888UHSU is the best cheap 4K monitor overall. While many 4K monitors are expensive, the Iiyama ProLite B2888UHSU does an excellent job of providing brilliant 4K performance for video and photo editors at a competitive price point. It comes with a TN panel, which isn't too hot at viewing angles – but you'll be fine when sitting directly in front of it. And it has a large number of video inputs as well. This is a fantastic pick if you're looking for a cheap 4K monitor, and you'll find the best deals available above. Got a bit more money? This is the best mid-range 4K monitor. If you've got a little more money to play with, Acer’s S277HK is the best mid-range 4K monitor out there. It isn't as cheap as our best budget pick (above), but it's still affordable compared to many 4K monitors, and it offers heaps of value for money. With a 1,000,000,000:1 contrast ratio, a colour gamut of 1.07 billion and a resolution of 3,840 x 2,160, the Acer S277HK excels at image quality. And while the minimalist design might not have a lot to shout about, some will appreciate its pared-down looks. The best cheap 4K monitor for photo editing. The LG 27UD88-W represents an excellent cheap 4K monitor deal, thanks to its (relatively) low price. It's a winner for photo editors in particular, as it comes with a wide selection of display modes, including sRGB, although there's no dedicated RGB preset. However, colour accuracy is excellent, and it comes with plenty of ports and a stylish silver design. This is a fantastic 4K monitor for creatives on a budget. Sure, the NEC MultiSync EA275UHD's design is a little boring. But it's what's on the screen that matters, and this is an excellent 4K monitor for photo editing. Colour reproduction is very good, and it has its own photo-viewing mode. The screen does need a bit of calibration out of the box to fully realise its potential, but if you don't mind fiddling with the settings, you'll get an excellent 4K monitor for your money. The best cheap 4K monitor for video editing and 3D work. OK, so the BenQ PD3200U isn't exactly cheap, but its screen size and resolution make it a savvy choice for video editors, 3D designers and creators generally. It boasts a generous 32 inches of screen real estate, so you can fully appreciate the 4K resolution of your video footage. Meanwhile, 3D designers will be grateful for the inclusion of a CAD/CAM mode, and everyone else will appreciate the factory-calibrated colour accuracy and Rec. 709 adherence. The best mid-range 4K monitor for video editing. If you have a little more money to spend, the ViewSonic VP3268-4K is a top-class mid-range 4K monitor that makes for another ideal choice for video editors, thanks to its large screen size and impressive contrast ratio. It also includes a HDR mode, which many video editors will feel is an essential feature for a monitor, allowing you to edit your HDR footage. 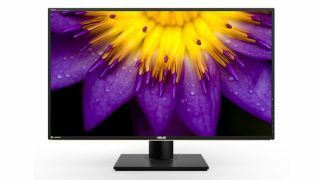 It's not the best when it comes to Adobe RGB coverage, but for the price you're getting an excellent 4K monitor, and there are some great deals out there to get the screen even cheaper. The best cheap 4K monitor for graphic design. The Asus ROG Swift PG27AQ is a cheap 4K monitor that's mainly aimed at gamers, but here's the thing: it's also an excellent screen for graphic design. As well as giving you accurate colours and a good contrast ratio, it's got some great preset modes to help make your work look as good as can. While it's expensive for a gaming monitor, it's a very reasonable price if you're a professional graphic designer looking for a 4K screen (and if you fancy playing a few games on it as well, then even better). The best mid-range 4K monitor for graphic design. As the name suggests, the ProArt PA329Q is Asus' cheap 4K monitor aimed at digital creatives. This means it comes with high colour accuracy, with almost 100% Adobe RGB and DCI-P3 colour spectrum support as well – making it an excellent choice for creatives. It also comes with plenty of input ports, the screen size is nice and large, and with a 60Hz refresh rate, it feels fast and responsive as well. This is an excellent mid-range 4K monitor. The best mid-range 4K monitor for digital artists. The Dell UltraSharp UP3216Q wasn't a cheap 4K monitor when it was first released, but now that it's been out for a few years, there are some excellent deals to be had with this screen – making it our pick of the best affordable 4K monitor for digital artists. You want the colours displayed on your monitor to be as accurate as possible, and, for the price, the Dell UltraSharp UP3216Q's colour accuracy is excellent. Dell is well known for making very good monitors, and its reputation is ensured with this brilliant cheap(ish) 4K screen. It doesn't have some of the features that some newer monitors have, such as HDR, but it's still a top choice if you're looking for a bargain.